I&apos;ve just recently done a complete redesign and rewrite of my course platform site Learn Build Teach. Originally, I created it using WordPress along with a Divi, a very popular theme that includes a visual builder. While my site worked fine with Wordpress, there were several reasons why I decided to migrate, so let&apos;s dive into the why. Gatsby is an increible option for creating static sites. Netlify provides a great static site hosting plan for free. 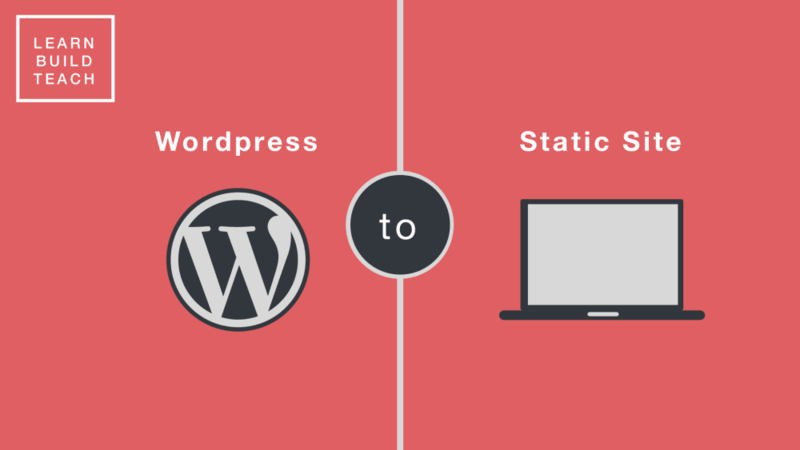 By combining the two, you can migrate your site from Wordpress and improve your site&apos;s speed and security as well as your development experience. Additionally, I struggled with getting a good workflow for deploying new versions of my site. I found a migration tool that worked well, but I didn&apos;t find a way to connect a deployment strategy to source control. I had to export my site locally to a file, then upload that file to the live site... this just never felt right. Here&apos;s a few of the things I struggled with. Because of these reasons, I started looking at other options. I&apos;d heard developers rave about a few different Static Site Generators, so I figured it was worth a shot. Here are a few worth checking out. Although I didn&apos;t want to change much visually, I did start with creating a new design for the site. I&apos;ve been trying to constantly improve my design skill, so figured this was a good opportunity. The original wordpress site did not have blog posts attached to it, yet another reason why using Wordpress was a bit overboard. Because of this, I didn&apos;t actually have any data in my Wordpress DB to migrate over. However, when migrating from Wordpress, this would be a common necessity, so I did a little digging. Static Site Generators often use Markdown files to store the equivalent of blog posts ( and whatever else you want to use them as), so you would want to convert your blog posts to markdown files for them to be carried over. Here&apos;s a couple of tools to help you get there! Here&apos;s what the new design looked like. Because of my struggles with Wordpress it was really important to me to have all of the source code for my site checked into source control. In the spirit of Open Source I decided to create a public repository in Github. Feel free to check it out and *make pull requests *if you want to contribute! After running through that series on Gatsby, it was time to start building. I determined my MVP version only has one page with a few different sections. Additionally, static site generators are great at pulling in data from Markdown files. Ideally, I want to pull course data that way, but I decided not to for the MVP. I simply hard coded the class title, description, and image url. Don&apos;t judge! With an MVP version of the site ready (skipping over handling newsletter subscribers for now), it was time to find a host. After hearing tons of positive feedback about [Netlify](https://www.netlify.com/\) I decided to give it a try. Turns out, it was incredibly easy to get my site hosted with Netlify. I was able to create a new site, setup Continuous Deployment by connecting to my Github repository, and have my site deployed in just a couple of minutes. I&apos;m not kidding, it was less than five minutes, and the best part...it was totally free! The most complicated piece of the whole thing was handling new subscribers to my newsletter. I use Mailchimp to handle my newsletter, and the Divi plugin in Wordpress made it super simple to integrate with. After looking at the Mailchimp docs, I figured out you can include a script in your site that would handle everything for you but I didn&apos;t like this for 2 reasons. So, I wanted to handle the actual Mailchimp API call on the server, but with static sites, you don&apos;t have direct access to a server/backend. This is, in fact, one of the "downsides" of static sites. However, Netlify, has a service called Lambda Functions, which allows your to create and host serverless functions to add functionality to your app. I&apos;m incredibly proud of the migration that I&apos;ve gone through so far. I had to learn so much! Static site generators, Gatsby, hosting with Netlify, the Mailchimp API, as well as Lambda Functions in Netlify. All that said, I still have work to do. After migrating from Wordpress to Gatsby and Netlify, I feel great about several things. I&apos;ve got complete control over my code. I&apos;ve got an amazing development workflow...just push to Github and Netlify does the rest. Lastly, I&apos;m staying up to date with some of the latest trends in Web Development!